We love this new keylight - custom flashlight. 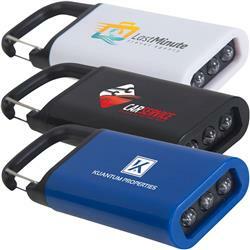 It has a convenient built in clip to hang on belt loops, backpacks or key chains. 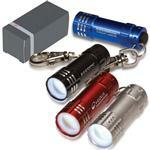 Quick release pull-apart flashlight lights up brightly with the 3 LED bulbs. No more awkward keychain light while trying to unlock your door. This light has 10 lumens for distance of 11 yards. 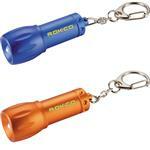 It comes with two non-replaceable CR2032 batteries. Since the lights are LED, these batteries will last years with regular use! Available Imprint Options: Single Color included. Full color available with run charge.